The Fujisan Maru was built in 1931 by the Harima Dockyard as an oil tanker for the Iino-Kaiun Line. Her peacetime duties consisted of carrying crude oil from the US to Japan. The Japanese Navy took control of her in late 1941 to utilize as a “Fleet Oiler.” She participated as part of the Aleutian diversionary task group at time of Pearl Hbr attack, the Battle of Midway, and due her fast speed, was part of the “Tokyo Express.” Fujisan carried a deck cargo of 1900 troops in a desperate attempt to reinforce New Guinea. A B-17 managed to hit her with a bomb in December 1943, but she was back in service by early 1944. During the “Hailstone” attack, Fujisan Maru was one of just a few vessels underway, trying to escape after discharging her oil cargo. On first day she tried escaping out North Pass but turned back in view of major actions there. Anchoring overnight by Moen Island’s South Field, she was again under attack at daylight while raising her anchor. Before anchor was fully raised her captain ordered Full speed to avoid the bombs running at flank with anchor dragging and bouncing along bottom, up the southeast side of Moen Is. when hit by a near miss bomb off her port aft quarter. Proximity explosions do more damage than any other, and this blast pushed in the entire port side of engine room, then sucked it back out in the recoil. She immediately filled aft with stern going down to bottom at 210 ft leaving bow pointing skyward at about 60deg angle. Slowly through balance of that day the bows gradually dropped until next morning nothing remained except quantities of fuel leaking to surface. It is a great wreck site sitting near upright with bridge house intact forward and engine enunciator (telegraph) still showing Full Speed ahead. The quarters are virtually untouched except by time, and lots of surrounding life outside. A large long round object protrudes from port side of engine room angled up with end about 20 ft off bottom. It has size and appearance of a mast, but a close look reveals it is solid steel, and actually the 24inch diameter tailshaft broken away from main engine and pulled out within countering suction of the explosion’s reversal. An amazing sight once understood. Her large diesel exhaust funnel stands erect atop the aft house. 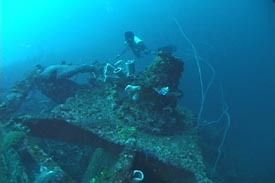 The Fujisan Maru was found by two Continental Micronesia pilots, who noticed her oil slick, on a flight into Truk in 1976. She now lies in 210 fsw. Launched: 31 MAY 1931. Crew: 48.